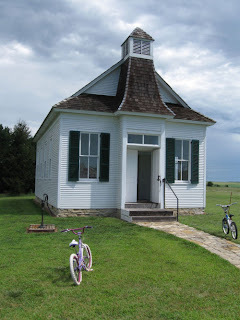 The Genealogy Road Trip culminated with the primary purpose for the trip: a visit to Princeville, Illinois, to the Heritage Harvest celebration at the Princeville Heritage Museum. What a great day! 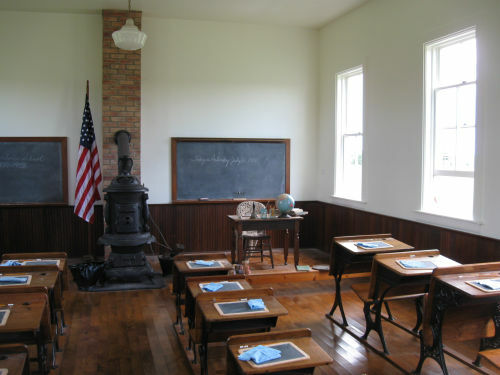 In 2004, the Akron Townhouse School was was moved to the grounds of the PHM's grounds. It had closed its doors as a school in 1958, and was the last of Peoria County's one-room schools. It has been taken from a state of disrepair, to a wonderfully restored piece of Peoria County history. We also got to witness a sawmill demonstration - this may not be new to anyone else, but I've never really thought about how boards were made, starting with a tree. 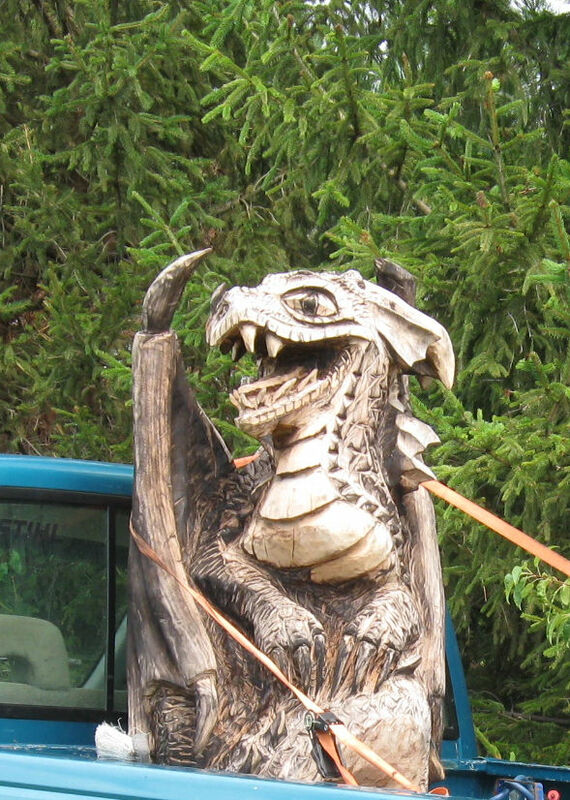 Next was an incredible demonstration by T. C. Gill, "The StumpCarver". His creations are incredible! 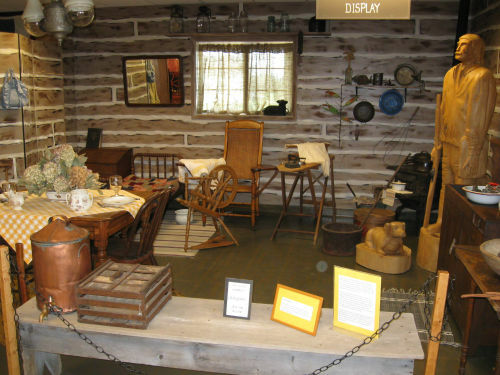 The above photo depicts a typical one-room cabin of the early settlers. Incredible - from the wonderful paint job on the walls, which look like logs, to all of the materials on display. I wanted to jump the barricade and go see that old quilt on the bed behind the table, but I kept myself under control. 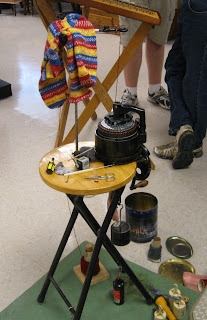 I enjoyed the demo of the 1920's knitting machine - she had a pair of socks in progress. 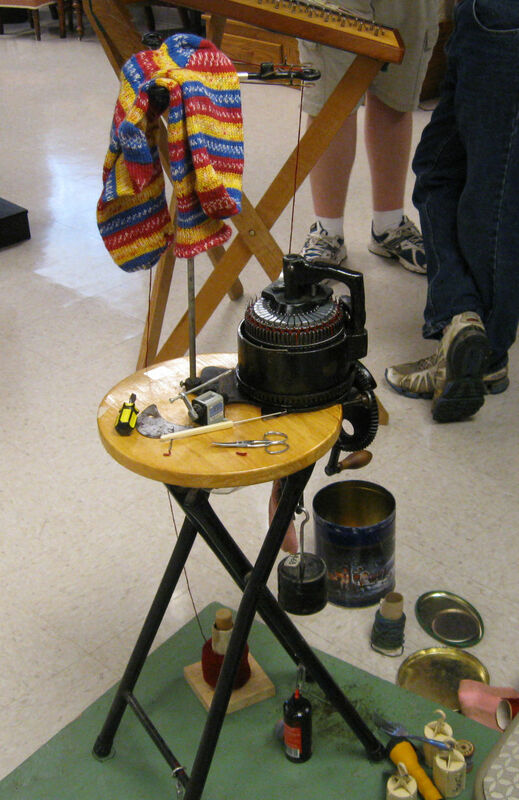 Much neater than any knitting I've ever produced, and even *I* could turn a crank without messing it up! The rest of it, though, I'm not so sure about. 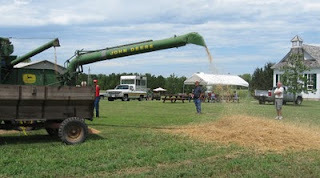 I learned alot from the threshing machine demonstration. Being a city kid, I had no real clue about what this machine did, but thanks to this demo and my husband's patient explanations, I have a handle on it now. :) I can also have a much greater appreciation for my great-great grandfather's steam thresher. This short post doesn't even begin to cover everything that we saw and enjoyed today. 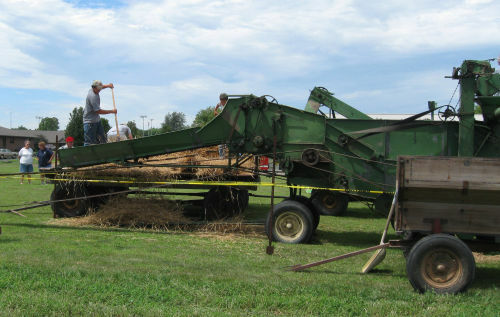 There were numerous historical photos, tons of genealogical scrapbooks filled with old newspaper articles, obituaries, etc., a rope-making demo, crafts, a dulcimer artist, and so much more. It was well worth the trip. 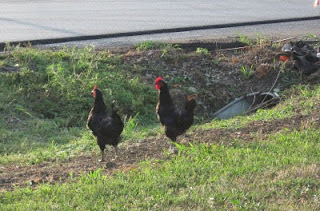 We spied this pair of handsome roosters grazing in the ditch outside of the Dollar General store in Wyoming, Illinois. All in all, a fun day. But wait - there's more - our day also included an awesome Bonus Event, which will be another post. First on today's agenda is West Liberty, Iowa, to find the graves of Frank and Retta (Gladfelter) Lair. Frank was the much younger brother of my gr-gr grandmother, Nettie Belle Lair of Princeville, Peoria county, Illinois, being 16 years younger than Nettie. 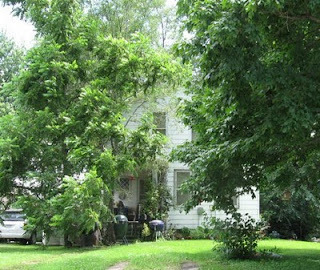 Frank and Nettie were two of the nine children of Lawson Fuller Lair and his wife, Margaret Nickeson, who farmed just outside of Princeville. As a young man, Frank spent some time living with Nettie and her husband, Tom Graves, before marrying Retta Gladfelter in 1901. 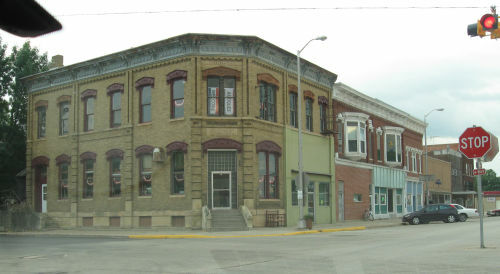 Frank and Retta moved to a Muscatine county, Iowa, in 1907, and there lived on several different farms before moving into West Liberty about 1919. His bride, Retta, was the daughter of Frederick and Julia (Bane) Gladfelter, and born in 1882, also in Princeville. They lived out the remainder of their lives in West Liberty, having no children. Frank died in 1945, at the age of 67, and Retta in 1959 at the age of 77. Misson #2 Complete. On to Mission #3, and The Land of Lincoln! Perhaps a better title would have been "MISSION IMPOSSIBLE." There's something particularly satisfying about getting out of town when all day long, nature and fate have conspired to keep it from happening. The day started at 4:30 a.m., with a drip coming from the ceiling, landing on the floor next to the bed. Actually, it was a *bunch* of drips, landing in the *puddle* on the floor next to the bed. The rest of the day followed suit, but by 6 p.m., all the days' fires had been extinguished, and we were on the road, only a half hour behind our hoped-for schedule. 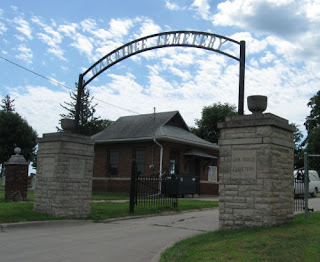 First stop: Clarksville, Butler county, Iowa, to locate and photograph the graves of Andrew and Flora (Wells) Stevens. Andrew, a New York native and son of Lemuel Stevens and Celinda Sharp, was a blacksmith in the area for 59 years. His wife, Flora, was a native of Stephenson county, Illinois, the daughter of Philip Wells and Matilda Miner. 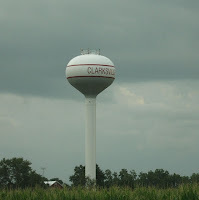 They raised twelve children in Clarksville and Northwood, Flora passing away in Northwood, Worth county, Iowa in 1924, and Andrew at the home of his son in Longmont, Colorado, in 1936. I wasn't completely expecting to find Andrew and Flora's graves, since this cemetery was not specifically mentioned by name in their obits, but was hoping to find a small cemetery that we could walk easily. What we found, however, was a pretty sizeable grounds, with a LOT of burials. 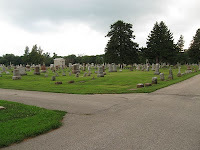 We walked the older sections, probably close to a third of the cemetery, but the heat, humidity, rain sprinkles, bugs, and darkness finally forced us to give up. 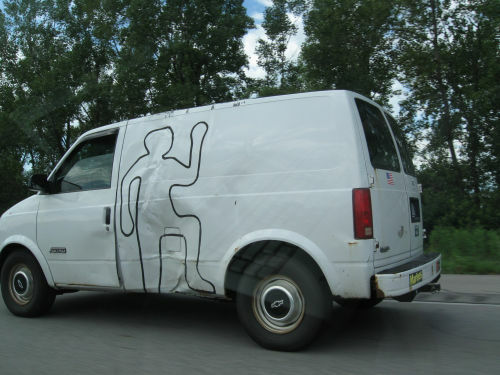 We are expecting some return calls from some potentially helpful local resources who might help us locate their graves more specifically, and maybe we'll be able to find them on our way back home. When walking cemeteries like this, seeing the same surnames over and over, spanning several generations, I'm always a bit envious of those who lay forever in "their" land with "their" people, and the sense of continuity and belonging it provokes. My grandfather’s new coupe – Beadle County, South Dakota. Date unknown. I did not know he wrote "Fight Club." I've seen the movie...Not sure what to make of that comparison. Reading up on Wikipedia, I find that the Los Angeles Times book editor David Ulin called Wallace "one of the most influential and innovative writers of the last 20 years." Hmmm! Good! However, reading on, I see that Wallace committed suicide 2 years ago. Hmmm.... not so good. Well, if nothing else, it was fun. No place in the world says “home” to me like the Third Street Bridge area over the James River, in Huron, South Dakota. Over my years in Huron, it became a place I frequented. 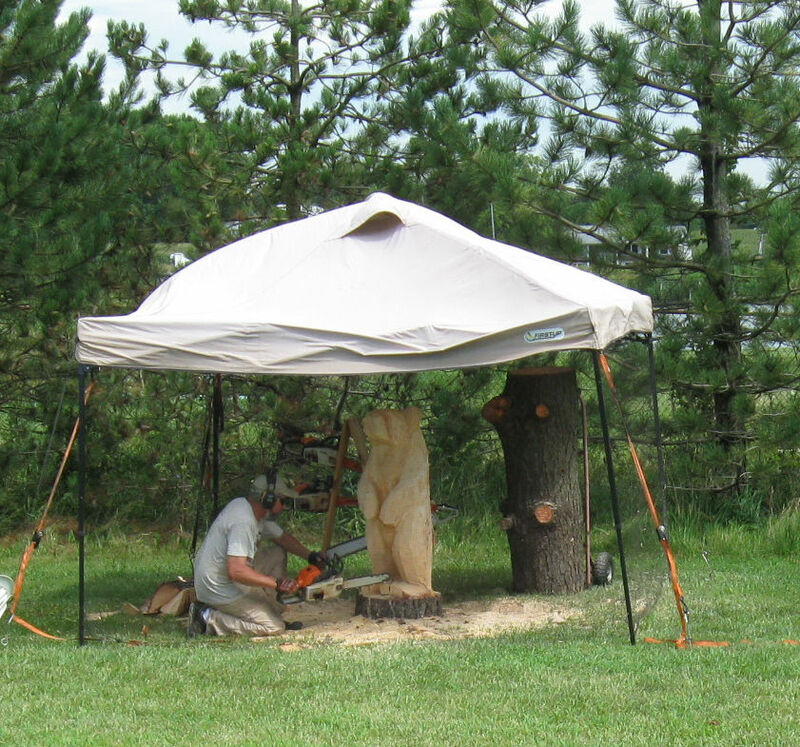 As a high school art student, I’d go there to sketch. 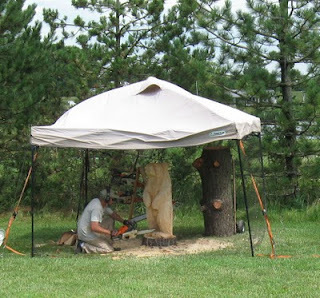 I’d go fishing with friends there in the summers, and snowmobiling in the winter. I considered a dare to walk across the spillway one summer when the water was low, and numerous dares to zip across the trestle and hope a train didn’t have the same idea at the same time. I took my kids to eat our McDonald’s lunch there, and watch the trains go by. And sometimes, I’d go there just to peacefully contemplate life, and ponder the mystery and the tragedy of the lives lost in those waters over the years. Above: A more recent photo of the railroad bridge, and the automobile bridge in the background. On my increasingly rare trips home, driving into town and seeing the river, the bridge, and the trestle, and all of the familiar sights that follow, warms my heart and soul like nothing else. Sometimes you just know that someone has come into your life for a reason, and such is the case with Warren Throndson. We are distant cousins, both of us obsessed with family history, and we lived in the same town for 8 years before accidentally discovering each other. It could have easily gone the other way, both of us living out our lives and never knowing the other existed, but thank goodness it didn’t happen like that. I was just starting my Graves research, actually beating my head against a brick wall, when I realized that the Graves men, typically named Thomas, John, and William, all lived in the same area and all had sons named Thomas, John and William. The patriarch of the family, William Graves, himself a family historian, was said to have left a Bible with the family records behind when he passed on into eternity back in 1908, in Stark county, Illinois. Desperate to find that Bible, and any help it might give me in sorting out these Graves men, I wrote the genealogy society there and inquired if anyone might know anything about it, thinking perhaps he left it to them after his death. I got a letter back saying no, they knew nothing about any Bible. A wasted stamp, I assumed, but it turned out to be the best 32 cents I ever spent. 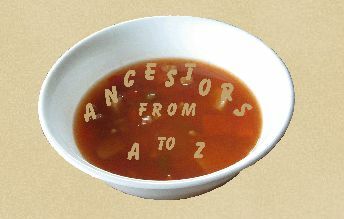 As it turned out, another descendant had inquired about the William Graves family a few weeks earlier, a fellow named Larry from nearby Peoria county. When the Society received my letter, they contacted Larry and gave him my address, in case he wanted to follow up. 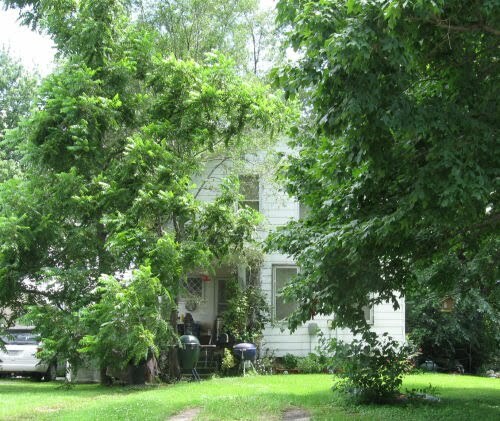 He saw the town, and immediately thought of his uncle, Warren, who also lived here, and had done extensive research on the Graves family, with said William Graves being his great grandfather. Before the day was out, Warren and I had the first of our many phone conversations. Now, I have to say, in the last 15 years or so, Warren and I have only met face-to-face a handful of times, but we’ve logged hundreds of hours on the phone. Usually, our conversations would be seasonal, as he wintered in Texas, and had a full social calendar there, but occasionally he’d make an exception - when our weather here would be especially frigid, he’d call to tell me how much he enjoyed the freshly picked fruit, from his yard, that he’d had for breakfast that morning. Or he’d call on a Sunday night, to tell me to “have a good Monday” and keep paying into the retirement system so people like him could enjoy life! He had a great sense of humor, and loved to tease. But mostly, we talked about family – those currently in our lives, and those we researched. While our official relationship was “second cousin twice removed,” I think it’s probably more accurate to say he was a treasured friend with whom I had history in common. Plus, he was the only person I knew whose eyes would not glaze over when I got started talking about genealogy, and vice versa. Warren passed into the land of ancestors himself last weekend. I was blessed to have been able to see him three weeks’ prior, when I found myself at his home, and I knew it would be the last time I saw him. I can still feel his hand squeezing mine as we said goodbye. His contact information is still in my phone, and I think I’ll leave it there awhile. I just wish I could see his name flash on the screen just once more while the phone was ringing.